Snack Music is SNAFU throwing a curious sort of house party. Grab a snack, tell a story — your first kiss? your first night away from home? your first time doin’ it? 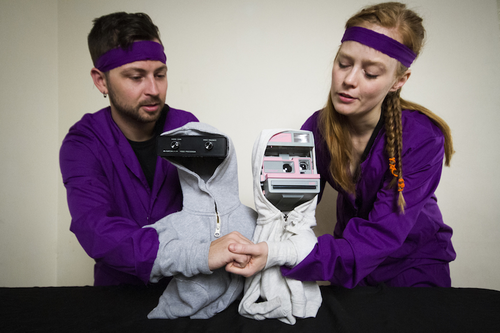 — and then watch co-creators Ingrid Hansen and Andrew Young act it out through off-the-wall puppets. It’s an acting exercise on steroids, and it’s a ton of fun. SNAFU’s work (most recently their 2014 Fringe hit Kitt & Jane) is always informed by a deep and profound reverence for taking risks, being awkward, and choosing to be vulnerable. As Hansen explains in her preshow spiel, Snack Music is about trying to get people to open up to each other and dabble in that space where marvelous things happen: tell us a story — a silly, secret story — and she promises to love it, in story and in song. This project could totally jump the rails if the crowd doesn’t play along, but Hansen has a peculiar knack for tugging her audiences into the right headspace to make it all jibe. Hansen and Young are joined by multi-instrumentalist Steve Chmilar, who uses live loops and audience participation to underscore the evening. Every story gets a soundtrack, including proper cues for the title and moments of high (melo)drama. The show’s finale — this is SNAFU, so get ready for a singalong — will leave you humming the melody all the way home, and counting the hours ’til you can come back for more. Bring your best story, smile your biggest smile, and be ready to open your heart to a room full of strangers. Give this show a little hug, and it’ll hug you right back. Tickets for Snack Music are $10. Snack Music is performed in the Antechamber, so advance purchase is strongly recommended. Photograph of Andrew Young and Ingrid Hansen (and friends) by Laura Dittman.